After a good sized "outlier" type drawdown, the trader has a big incentive to be extra vigilant and cautious with the timing and execution of their strategy, so that is why drawdown periods on good strategies are good times to invest. You are right but this is due to divergence that is a technological problem. Often investors lose buecause they want to dream and brokers, banks, fund sellers sell them these dreams. Here we have 3 years of growth between october 2015 and october 2018..
August 2015 .... huge Red Flag.... -36% month??? Do your homework. The consistent winners are out there. You are always finding the negative examples. Attitude and resilience are everything eh. A portfoilio really only needs 3 strategies, and that way you can exert more control and vigilance and dialogue with the trader more in depth. Do your homework. The consistent winners are out there. You are always finding the negative examples. You can start investing today an than we compare our results at the end of 2019. Honestly when I don't want to trade anymore, then I will consider vehicles for alternative investment. Right now though, my money gets the best ROI from my own trading and equity growth. There is only one trader online, with visible stats, who has gotten a better return on his initial capital in the past 2 years than my strategies. So the best place I can use my money (like in a business ready to take off) is by re-investing in my own trading strategies. High, medium, and low risk. Ok but as long as you are not doing it you cannot state that it is easy. As trader you know 100% of your education, discipline and development process. With other people you know 10% in the best case, a line and some numbers. Yes, but only if they recover afterwards, which you will only know with hindsight. Maybe the strategy has stopped working because the market conditions that made it work have changed a bit. Then it could continue losing. This is one of the areas I struggle with. The same for me, doesn't make sense for a trader but I spent a lot of time with this project so I want to complete it and be profitable as investor, maybe I am masochist, maybe because I was born investor on eToro. So the best place I can use my money (like in a business ready to take off) is by re-investing in my own trading strategies. 100% agree on that, the best investment is always in yourself. I am considerig this project as something different, there is a ME as trader and a ME as investor. Being able to find and invest good traders is different than being a trader, and so far it seems to be more difficult. Most traders who've made it past 3 years with good all-around track record and proven edge in the market do not need to show themselves online publicly anymore. They move to private mode, trading other's assets or trading their own capital and keeping everything private. If I have another year in 2019 like I did in 2018, I will be joining those ranks. It could be but i dont' think that beating the market for 3 years can be as profitable as managing 1-3 millions as top darwins here. It can be for scalpers, if you scalper works only with 100k and you have it you are right to trade it alone with your money. @CavaliereVerde Thanks for your reply. Just a little on the subject of diversification (after losing money in the past following signals, where either they turned out to be Martingales, or the trader lost control in a drawdown, and pretty much blew the account) my focus is in risk management. I created the chart shown by trying different numbers of Darwins in a Demo account to see the affect on VaR. No respect to correlation was given, I just picked the top twenty from the "most investors" filter. It seems that beyond about 10 Darwins, adding more does not make much difference to risk. But I guess to reduce the probability of a big loss (a single Darwin quickly losing 50% for example) having a large effect on the portfolio, the more Darwins the better. I don't know what the magic number is! Exact I agree, a very high number of darwins does not help because darwins are not so uncorrelated. The advantage of a wide portfolio is with traders going crazy and black swans. you must do some calculations. If I managed 2,000,000 here and made 20% profit, I get 20% performance fee on that. Trading you money high risk is s possibility but maybe i prefer to trade it at VAR 10% and manage a fund. People here is for the second choice. People with 10 years of trackrecord have hedge funds not accounts on Zulu. Here Ernie Chan traded his money with a leverage of 10 in 2011, than turned his trading to a fund with a a leverage of 2. Sorry but Zulu is a scam. I don't even understand how you can trade there. There are so many restrictions. Can you telle how many your copiers have gained with you? There is another topic to speak about Zulu and copytrading sites. Here we are speaking on what makes sense as investors, not as providers. Negative December too? Ouch. All of my demo portfolios did better than my live one, but even there I got +1.5% in December. Hopefully new year will be a good one. Thanks for continuing to publish results regularly, even when they are not pleasing! 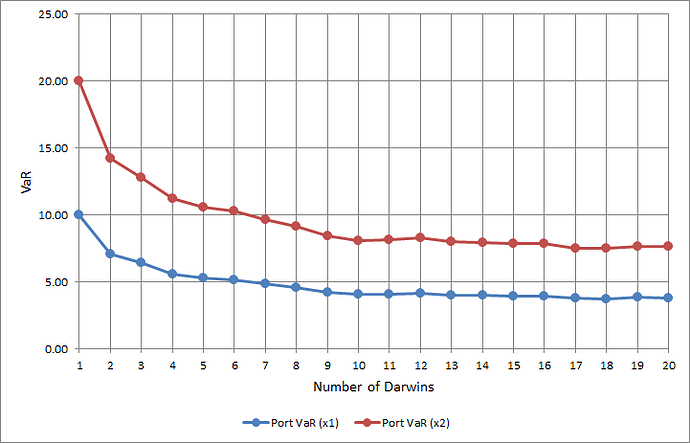 Interesting to see how a large portfolio smooths out the volatility of individual Darwins. That was the mistake I made in the past, jumping in and out of individual Darwins. It tends not to work, for me anyway. I'll try and be more disciplined and take a more structured approach this year.